Recently, Dimitri published the results of measuring MySQL 8.0 on Intel Optane storage device. 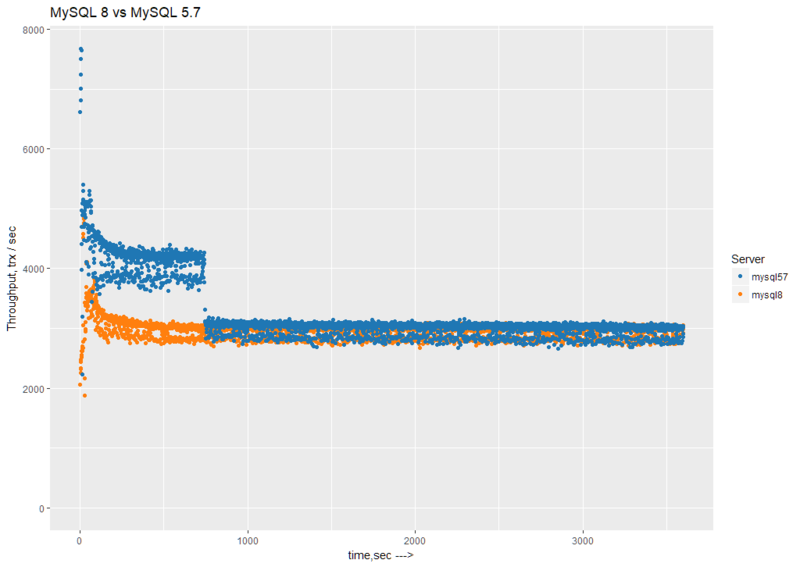 In this blog post, I wanted to look at this in more detail and explore the performance of MySQL 8, MySQL 5.7 and Percona Server for MySQL using a similar set up. The Intel Optane is a very capable device, so I was puzzled that Dimitri chose MySQL options that are either not safe or not recommended for production workloads. (even though the default is utf8mb4 in MySQL 8) and I set a total size of InnoDB log files to 30GB (as in Dimitri’s benchmark). This setting allocates big InnoDB log files to ensure there is no pressure from adaptive flushing. Though I have concerns about how it works in MySQL 8, this is a topic for another research. So let’s see how MySQL 8.0 performed with these settings, and compare it with MySQL 5.7 and Percona Server for MySQL 5.7. I used an Intel Optane SSD 905P 960GB device on the server with 2 socket Intel(R) Xeon(R) CPU E5-2680 v3 @ 2.50GHz CPUs. To highlight the performance difference I wanted to show, I used a single case: sysbench 8 tables 50M rows each (which is about ~120GB of data) and buffer pool 32GB. I ran sysbench oltp_read_write in 128 threads. After achieving a steady state – we can see that MySQL 8 does not have ANY performance improvements over MySQL 5.7. 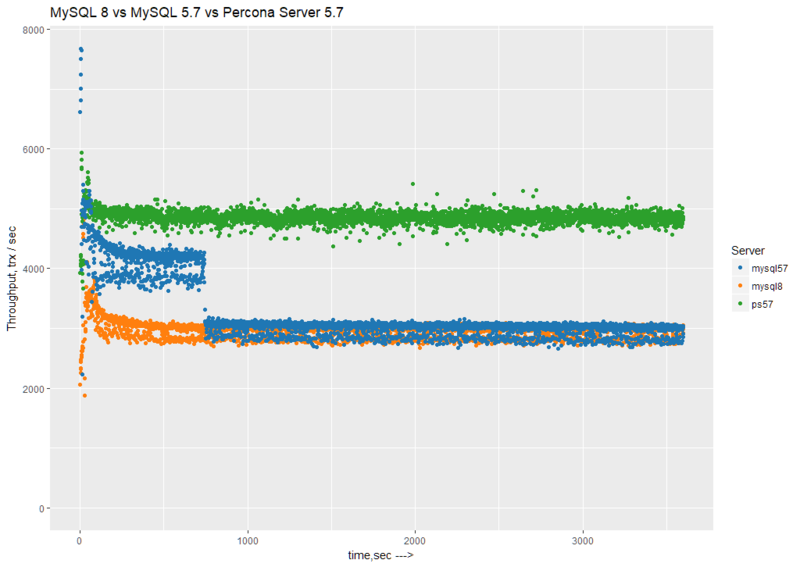 Percona Server for MySQL 5.7 shows about 60% performance improvement over both MySQL 5.7 and MySQL 8. Parallel doublewrite. In both MySQL 5.7 and MySQL 8 writes are serialized by writing to doublewrite. Multi-threaded LRU flusher. We reported and proposed a solution here https://bugs.mysql.com/bug.php?id=70500. However, Oracle have not incorporated the solution upstream. Single page eviction. This is another problematic area in MySQL’s flushing algorithm. The bug https://bugs.mysql.com/bug.php?id=81376 was reported over 2 years ago, but unfortunately it’s still overlooked. For MySQL 5.7 and MySQL 8 the numbers are 824 MB/sec reads and 530 MB/sec writes. My opinion is that Oracle focused on addressing the wrong performance problems in MySQL 8 and did not address the real issues. In this benchmark, using real production settings, MySQL 8 does not show any significant performance benefits over MySQL 5.7 for workloads characterized by heavy IO writes. With this, I should admit that Intel Optane is a very performant storage. By comparison, on Intel 3600 SSD under the same workload, for Percona Server I am able to achieve only 2000 tps, which is 2.5x times slower than with Intel Optane. To get all the benefits of Intel Optane performance, use a proper server—Percona Server for MySQL—which is able to utilize more IOPS from the device. The post On MySQL and Intel Optane performance appeared first on Percona Database Performance Blog.